Five years after two non-UC members claimed the student body’s highest elected offices for the first time in its history, more outsiders have tossed their hats in the ring than in any Council election in over a decade. It was October 2016 and Grant S. Solomon ’18 and Alexander T. Moore ’18 were determined. 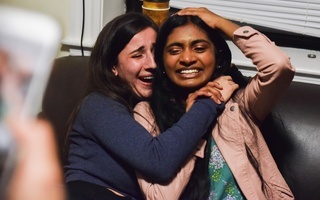 They planned to vie that fall for the presidency and vice presidency of the Undergraduate Council — Harvard's student government body — and they fully intended to win. Neither had previously served on the Council, but they nonetheless believed their message could appeal to voters. They felt the UC needed fresh new faces in order to better meet students' needs. So the duo threw their hats in the ring and assumed they would be treated just like any other candidate pair. But, looking back two years later, Moore said that assumption quickly proved misguided. The student body at large — and in particular, student groups who dole out coveted endorsements to candidates — largely disregarded what Moore viewed as his ticket’s strengths. “I just felt like we were written off from the beginning,” he said. 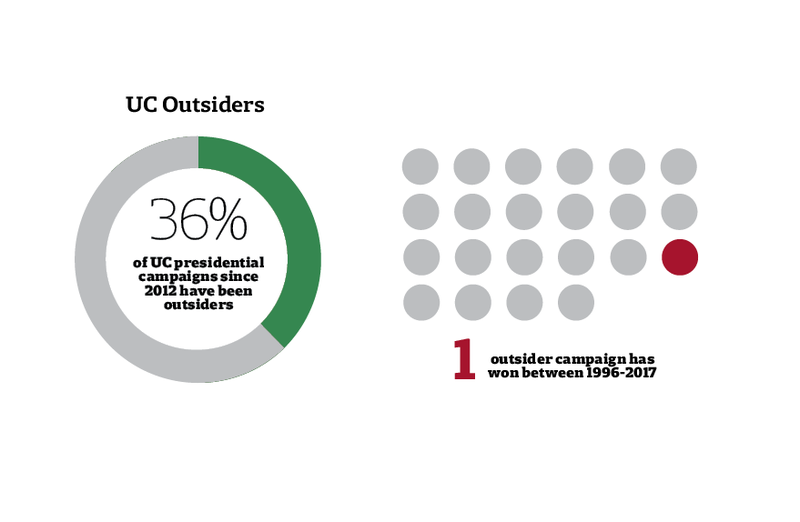 Most years, UC members are disproportionately overrepresented in the bevy of candidates competing for the Council’s presidency and vice presidency — and they've achieved disproportionate success to match. Since the Council began popularly electing its leaders in 1996, non-UC members have claimed victory only once. Now, five years after non-UC pranksters Samuel B. Clark ’15 and Gus A. Mayopolous ’15 earned the student body’s highest elected offices for the first time in its history, more outsiders are competing for the Council's two top jobs than in any UC election in over a decade. Current and recent candidates, though, continue to wonder if the barriers for non-UC members remain too high to overcome. Currier House resident Daniel K. Ragheb ’20, an outsider running for president in this fall’s election, said he spent the first few weeks of his campaign uncertain and anxious over what he was allowed to do per the Council's election rules. He agonized over possible penalties he might incur by unwittingly violating UC guidelines. Ragheb contacted the UC's election commission, but — at the time drastically understaffed — it failed to respond to his questions in a timely manner. When he checked the Council's website, he found it largely devoid of content. Ragheb said his campaign felt left in the dark about election policies — especially when it came to seeking student group support. “How do I know what I’m doing is legal or illegal?” was the question that dominated the early days of his campaign, he said. The lack of information nearly “scared” Ragheb out of running. Ultimately, though, he received replies from the commission in time to figure things out. Ragheb says the process taught him a lesson. “I think there’s a higher barrier of entry” for outsiders running for UC president, he said. Ragheb pointed out that Council insiders probably already know the body's campaign rules and may have more direct access to UC policies. Several past candidates agreed that outsiders face various institutional hurdles in seeking UC leadership positions. A second obstacle pops up well before voting starts. To appear on the ballot, prospective candidates must gather 150 signatures within about a week. That figure can be burdensome for non-UC members; outsiders typically lack a base of support from within their house given they have never before campaigned for office. Current UC Vice President Nicholas D. Boucher ’19 defended the petition requirement, which is detailed in the Council’s bylaws. Stephen T. Moon ’20, vice president of the Open Data Project, a faculty-student group that has analyzed past UC elections, suggested that previous experience campaigning marks another key advantage for presidential candidates. He said that, given students are randomly sorted into upperclassmen houses, a candidate who previously won a UC election in their house is more likely to appeal to a wider swath of the electorate. 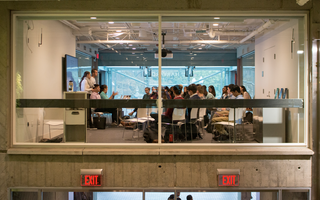 “I think there is a certain amount of skew in who has been on the UC before and who has not, in that I think the students that oftentimes feel very passionately about the issues they care about or about something they want to use the student government to do at Harvard College, oftentimes choose to get involved in the UC early on in their careers,” he said in an interview last week. Student group endorsements mark a key twist in the path to the UC presidency. Most candidates vying for the Council’s top elected offices — in addition to trying to convince individual voters of their merits — attempt to win the support of student groups. Moon said data from past elections shows club endorsements are “often consistent” with victory. He cautioned, though, that this could be because clubs choose to endorse candidates who are already likely to win. “I’m not totally sure that those endorsements are necessarily predictive and it might be in fact that they’re getting endorsed because organizations are seeing that so many people in their organization like them and that’s just because they’re overall very popular,” he said. 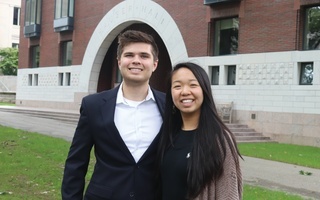 Boucher said the endorsements he and running mate Catherine L. Zhang ’19 received during the 2017 election helped to “bolster credibility” and “foster engagement” with student organizations. For outsiders, though, these expressions of support from student groups can be difficult to obtain. Moore said he feels that groups did not give him an equal shot at winning their endorsements when he ran in 2016. Moore also pointed to The Crimson Editorial Board’s UC endorsement process as one that seemed to favor insiders. The paper's Editorial Board typically endorses one ticket each year after interviewing all contenders. The Crimon's Editorial and News Boards do not coordinate coverage and maintain a strict separation in staff and management. While the endorsement article that year outlined the platforms of the other three tickets running for UC leadership, The Crimson’s Editorial Board did not mention Moore or Solomon. Ryan P. O’Meara ’18, an Editorial Board Chair at the time, did not respond to a request for comment about the board’s decision-making process at the time. Endorsements from fellow UC members can also provide significant organizing power, according to Healy. Analysis from the Open Data Project suggests, however, that endorsements from sitting representatives may not be as decisive. The group points to the 2016 election, in which victors Yasmin Z. Sachee ’18 and Cameron K. Khansarinia ’18 received ten endorsements from fellow Council members, compared to 11 for third-place finishers Scott Ely ’18 and Evan M. Bonsall ’19. One of the likely reasons outsiders have almost universally failed to win the student body’s highest elected offices, though, is quite simple: non-UC members have not appeared on the ballot at rates comparable to students with previous Council experience. Between 2009 and 2011, all 12 candidates who competed for the Council’s top positions had already served on the Council, some for multiple years. In every presidential election since 2012, at least one outsider has appeared on the ballot, but they have collectively comprised only 18 of 50 presidential and vice presidential candidates during that period. Healy said the lack of outsiders running for Council leadership may be in part due to widespread cynicism among undergraduates about the body’s work. In last year’s presidential election, only 2,074 students — less than one-third of the student body — cast ballots, representing the lowest voter turnout since the Council began popularly electing its leaders. Boucher wrote in an emailed statement that Healy’s criticism is largely unfounded. As campaign season kicks off for this year’s election, it remains to be seen whether an outsider can break through and declare victory for just the second time in Council history. A previous version of this article incorrectly indicated that Undergraduate Council president and vice president candidates Scott Ely '18 and Evan M. Bonsall '19 finished in second place in the 2016 election. In fact, they finished in third place. Despite Zhang and Boucher's shortcomings, we would be remiss not to recognize their commitment to trying to improve the Harvard experience for students.